Creole Chicken and Sausage? I don’t really know how to explain it, but it’s a like whoa yummy combo we have going on upinhere. 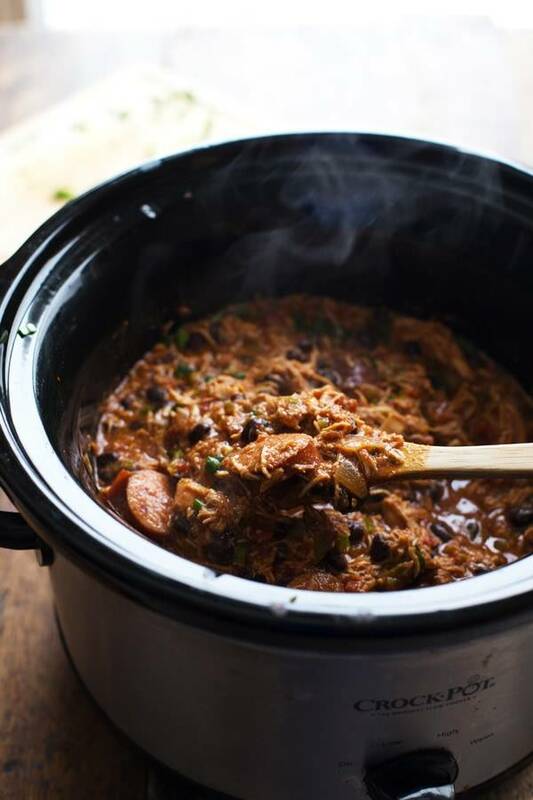 This idea originated as a simple shredded Creole chicken kind of thing made in the slow cooker so my cooking life could be awesomely easy and full of mouth rocking flavor, and then bam: it morphed into something a little more healthy. 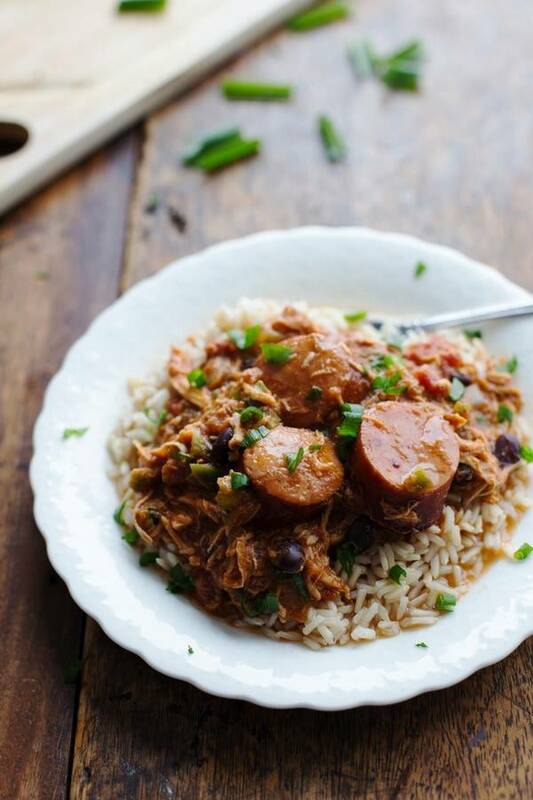 The addition of sausage (just kidding – not healthy and I still really ❤ sausage, in particular smoked Andouille sausage yum yum yum), beans, and bell peppers, all simmered up in that spicy tomato sauce? I’m doing the Creole Chicken dance right now. Don’t even imagine it. And then I became food weird and random things were added. Like almond butter – no explanation there – and brown sugar, and green onions. But food friends, please resist the temptation to think that this doesn’t taste good. I’m telling you: it was really good. And oh, how I looked forward to eating the leftovers for lunch all week. Like, seriously. 10 AM, in the middle of a lesson on single digit division, this was on my brain. But what else is new? Yesterday we returned home from our vacation to Arizona, and I’m not going to lie: I’m currently wallowing in the depths of Minnesota despair. I traded cucumber water and sandals for hot teas and slippers. It’s going to snow tomorrow, and for some reason my Facebook newsfeed is blowing up with people talking about yay spring. Like, what?! Breaking 40 degrees for a few hours in the afternoon is NOT yay spring. We probably can’t even be friends anymore if you’re going to act like that. Six days ago you may or may not have seen my cruising through the hood with my windows rolled down, sunglasses on, wind blowing in the nice 41 degree Minnesota air. But now I have a major crush on Arizona, and it’s really hard to like my home state right now. I can’t wait to show you some vacation pictures next week! One of my favorite things about how the blog has developed in the last year is how much interest you guys have in regular-life posts that I do every now and then. I am all about the food, and so are you, but I’m glad we can be friends. Like when I show you pictures of my house and you don’t judge me for leaving stuff laying around on the floor in the same exact spot for three months. Or when you forgive me for talking your ear off about cliche things like the current weather in Minnesota. That’s basically the definition of friendship. It’s the weeeeeeekend. I am so haaaaaaappy. 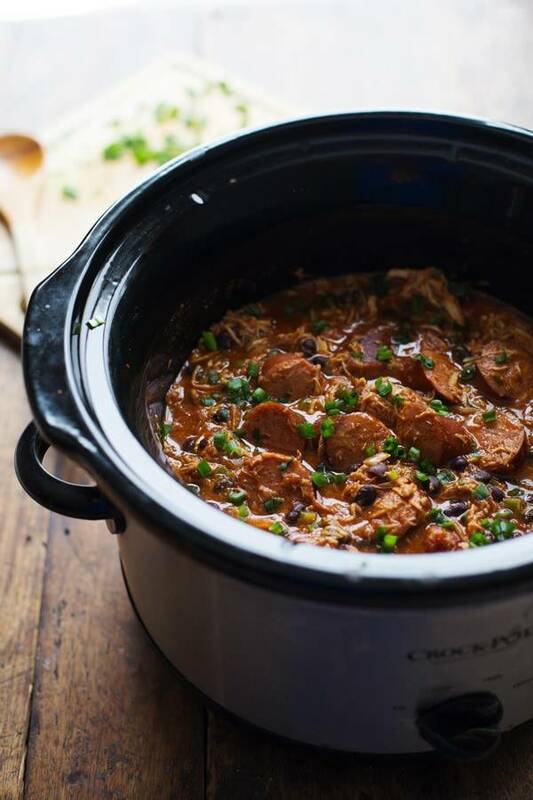 This Slow Cooker Creole Chicken and Sausage just takes 10 minutes to prep and has beans and bell peppers for bonus healthy points. Shred the chicken directly in the crockpot to your desired texture. Add the extras, if you want, and cover and cook for another 20-30 minutes. This is also a great time to make your rice, if you’re serving it with rice. When everything is ready, taste the chicken mixture and season with salt. Serve the creole chicken over rice and topped with green onions. This recipe sounds delicious! Can’t wait to try it! 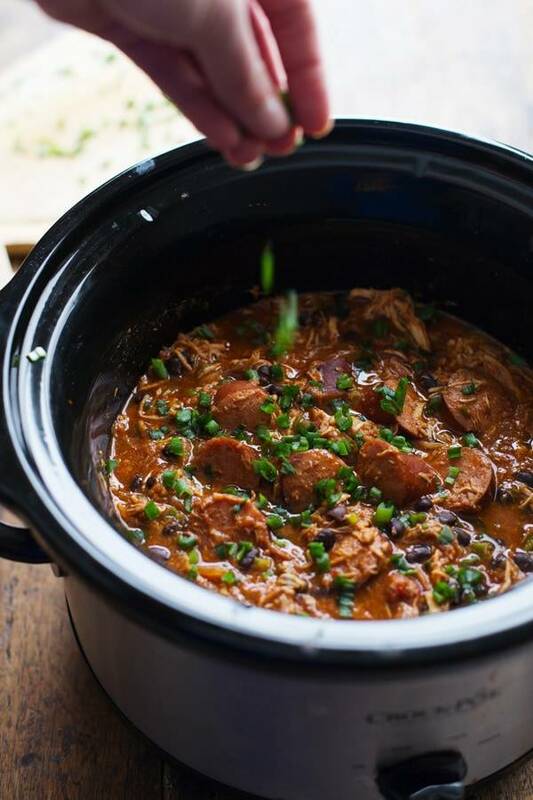 If I add the can of black beans, do I need to increase the other ingredients? If so, which ones and by how much? Nope, we would just add it in! Excellent recipe. I used turkey sausage and chicken wings. Thanks, Kailah! 🙂 Hope to see you soon too! How many servings is this please? I should know better than to read recipes late at night…man…now I am craving this something fierce! No worries – our first cold spell is coming this weekend and this is at the top of my grocery list. I think with the addition of onions and bell peppers I am going to count these as my veggies and count the bowl as a meal in itself (with rice, of course). Thanks for sharing! I was humming and hawing about what to make on the weekend and asked my husband if he had any ideas and he found this recipe and it looks so easy to prepare! Looking forward to trying it out! i’m so exited to try this today! can i add the beans at the beginning or should i wait till the end? Glad you enjoyed it, Tanya! Any suggestions for making this cast iron pot style? We don’t have a slow-cooker/crock pot. Hmmm we haven’t tried it before, but think you could probably simmer it on the stove for a few hours to get it cooked through! I just made this but omitted the almond butter and brown sugar and it was delicious. I added a bag of frozen okra cuz I just felt like it needed something extra. Awesome, Alexis! Thanks for the tip! Not sure if you check these comments anymore but have you ever added brown rice to the crock pot and let it cook in with everything? I have another recipe that you can do that with and the rice is soo good and fluffy and mixes so well with the flavors of the food! That recipe is chicken and chicken stock, black beans, and spices so I’m thinking brown rice could go in the crock pot with this?! Hi Libby! We haven’t ever tried it, but think it would be delicious! Would love to hear how it turns out. Glad to hear it, Renea! I just made this for the umpteenth time but I wanted you to know why I made it tonight. This was the favorite dish of a very dear friend who died unexpectedly yesterday. So, I am taking this along with the sweet cornbread he loved to his family tomorrow. (pound cake too, of course!) It just made me feel good to be cooking his favorite meal. Thank you for the recipe! Excellent meal! I reduced the amount of cayenne. It had the perfect amount of spice and heat. Thanks for sharing! I don’t see salt listed in the ingredients – is this correct? It’s listed under “optional extras” as “salt to taste” – feel free to add some if you feel it needs it! I added the beans and almond butter and it was delicious! It looks like Tony Cacherie’s would be it! This is a favorite of my husband and I!! We have added it to the cookbook and have made it several times 🙂 We usually add black beans, brown sugar, and bell peppers and serve over rice. So delicious! Mmmmmmm. Tastes good! I made this today for the nice and easy Sunday dinner that can also be Monday leftovers after a long work day. For add ins I did the black beans and some swiss chard because I like to put hearty greens in everything… and it worked! 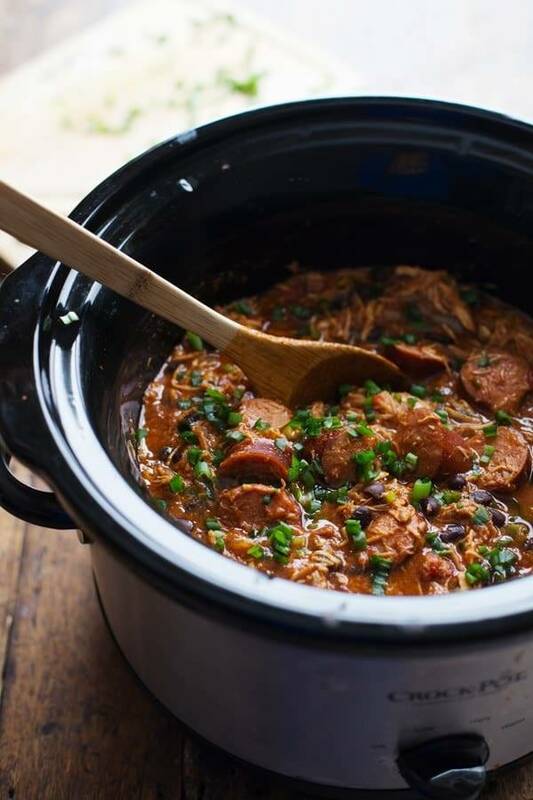 I did have to make my own creole seasoning, which is totally fine, but would love if you would include a link to your favorite creole seasoning/ recipe. Thanks for this, it was my first try of one of yours and it is great! Glad to hear that, Emma! Absolutely delicious. I will make this again. I made this today exactly as written except I added a little smoked paprika omitted the almond butter and. A little time consuming in prep but totally worth it. Cooked it in the slow cooker on high for 4-5 hours. The house smelled amazing walking in the door but even better, the final product was incredibly DELICIOUS. Thank you SO much for this great recipe. Looking forward to leftovers this week! Glad you enjoyed it, Laurie! we’ll sure try soon with in VEG.. Does this freeze well? I have way too much to eat in the next few days and wondering what your recommendations are for freezing. This was SO good! I was skeptical, I must admit, as I often think crockpot meals can be sort of flat on flavor, but this was delish! I added carrot and celery to the onion mix, and used mixed nut butter from Trader Joes, in lieu of the almond butter (since it’s what I had on hand), and a splash of red wine vin at the end. Great recipe, and so easy– thanks for the dinspiration!